This grittier remake of Wuzzles didn’t go over very well. Howard brings Terry, Dana, and Max to an island for a little camping. Unfortunately they chose the wrong island because Stalker has turned it into a hunting paradise for himself, splicing animals with dinosaur DNA to create dino-mammal hybrids to hunt. Terry’s friends fall into one of Stalker’s trap and the only way Stalker will set them free is if Batman joins him in a hunt. 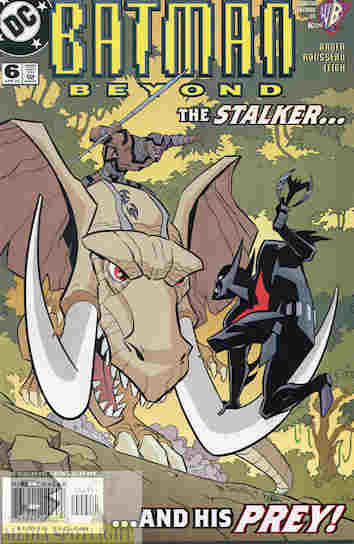 While Batman only captures animals Stalker outright kills them, the collected animals becoming bait for a T-Rex/hippo hybrid Stalker wants to actually hunt. Batman ends up being the one to take it and Stalker down, getting a ride back home. In a helicopter, not on…never mind. What they got right: I like some of the designs of the dino-mammals while others I’m neutral on. The idea that Stalker would create such things and that Terry/Batman would have to deal with them is a good story idea. What they got wrong: While I know it’s out of necessity I still have to remark that the story feels short, but only because we get to see two of Batman’s captures and I would have liked to have seen more. Maybe if this were a full episode, since I don’t think there’s enough here for a two-part comic. As to how Stalker got dino DNA? It’s comics. Recommendation: A rather fun story. Give it a read. Posted by ShadowWing Tronix on January 5, 2019 in Animation Spotlight, DC Spotlight, Television Spotlight, Yesterday's Comics and tagged Batman, Dana Tan, DC animated universe, DC Comics, DC Universe, DCAU, Stalker, Terry McGinnis.